This is a simple example of the well known observation game. I manipulated the image using Photoshop and then used hotspots, triggers, correct object states, hover reveals and a single scoring variable to complete the task, all on a single slide with layers. In hindsight I should have added a zoom & pan capability as this particular illustration is only viewable on a large screen. P.S. Sorry Mike Hall I didn't seek permission to use your beautiful illustration but hope the credit link to your site will attract work! P.P.S. 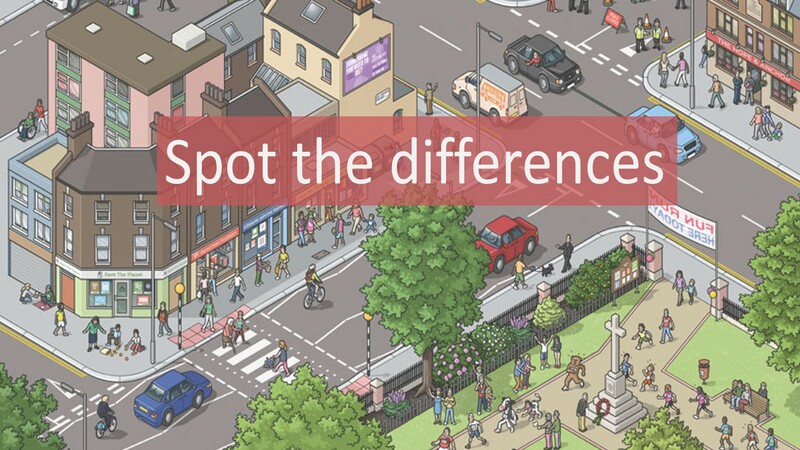 Let me know in the comments if you find all 11 differences without cheating! Fantastic example, Sam! In fact, this would make a great weekly challenge. I'm adding it to the list and will use your example as the inspiration. Thanks for sharing. Any chance you'll be at Learning Technologies next month? It would be nice to see you again. Thanks Brian & David .... looks great but have you succeeded?! David, I'm planning to escape early from a meeting in London to visit you on 2 Feb PM. It will be nice to meet you and the gang again ... so much has happened since we last met. I have a 3 year old, so we've been doing a lot of these lately. Nice job with the design. The only thing that would make it better is being able to zoom in on the picture. Some of the objects were hard to see and I'm using a 24" monitor. Thanks Chris. I agree, zoom would help enormously! I'm working on the optimum soution (probably an option which zooms both picture areas at the same time for easier comparison ... I decided that simply zooming on part would not be user-friendly. Thanks for taking the time to comment. Thanks Lewis. As well as my failure to include a zoom option, I have learned that it's also wise to include a guide to the age group/skill level that a game of this sort is aimed at. In this case I was creating a game to improve the observation skills of adults training to be surveillance operators! It was deliberately at the harder end of the spectrum. Very nice! You probably know this already but the mouse cursor flickers a bit when you hover over a difference, which sort of gives it away if you're just panning the mouse all over the screen. I got ten! I didn't see the little poster color change in the park. Hi Nick, thanks for letting me know. I wasn't aware of the hover flicker and cannot replicate it in Firefox or Chrome. The 'difference' hotspots are overlayed on a single hotspot which determines the subtraction calculations and I forgot to disable the 'hand' icon as I did with the difference hotspots. It may be that on some browsers this creates a flicker. I'll investigate further as it's quite a fundamental flaw! Fantastic idea... I failed miserably! However, I would suggest that you include an "icebreaker" -- at least one easy one to get people started and to keep them engaged. Thanks William ... sorry you found it so difficult. Your idea of an ice-breaker is a great idea and I have added it to the next version when I get around to it! Thanks David. I regret not making the amendments reviewers suggested but we'll see what this week's challenge generates. Hey, don't sweat that! You put the concept out there. That's good enough for me. There are always tweaks and mods but you can't address every use case. Any chance we'll see you this November? We'll be in London and Manchester. Yes, aiming for London. Looking forward to meeting up. Here's the source file for this example. Thanks for sharing the source file, Sam. Hey, it looks like the same question I asked two years ago applies today: "Any chance we'll see you this November? We'll be in London and Manchester." Thanks Sam. I look forward to learning more about how you did this. Yes, hoping to make one of them. "I have a 3 year old, so we've been doing a lot of these lately. Ni..."